Breaking out of their dinghy-exclusive past, Zhik welcomes the future with Isotak, a new range of high tech buoy racing gear that can be converted to have what it takes while sailing offshore. While we’re really into the idea of versatile gear, this gear still has to make some compromises in features for round-the-buoys versus offshore. It comes in a jacket, smock, dry smock, and salopettes. 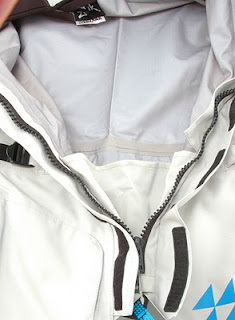 The jacket comes with a like-colored hood, but both the jacket and smock have the option of adding a florescent hood with a faceshield for offshore use. 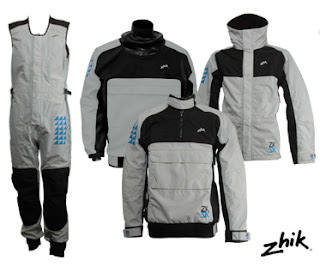 This gear is made of Zhik Isotak fabric, which has a very high specification waterproofness and breathability. 1000+ Denier Cordura in high-wearing zones, it’s designed to stand up against anything you throw at it. The Isotak fabric is a multilayer fabric, with a protective laminate inner, monolithic membrane, and a high- density microfiber nylon outer with a Super Durable Water Repellent (SDWR) finish. This creates a strong, durable material that is still breathable and completely waterproof. Seams are interlocking double seams with high quality taping to ensure they are all truly waterproof. Overall, the Isotak is a nice line of gear for those who do a wide variety of racing and would rather have one set of gear than deal with multiple sets. With a durable feel and cordura reinforcements, it would stand up to those who are hard on their gear, or who (fortunately for them) spend lots of time in their gear on the water. Overall, the Zhik Isotak jacket is nice. It’s certainly more durable feeling than other jackets in the high Tech buoy racing category. That being said, it’s also less substantial than offshore pieces. It makes a great jacket for those who do some offshore races in any given year but spend most of their time day sailing. There are some features you want for offshore racing and some that are left out. We found that the jacket tends to run on the small side for people who typically wear a large jacket due to the waist size and want of room for layering. It’s longer than most buoy racing jackets, making it a little nicer to go offshore. The Cordura reinforcement on the seat provides a little extra protection and durability. Durability is a definite plus. 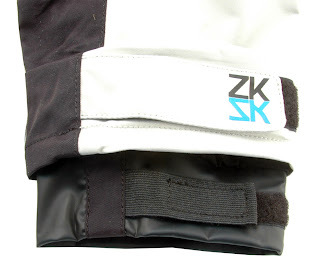 Zhik’s Isotak fabric feels much more substantial than the fabric used for other jackets in the high tech buoy racing category. With a fleece lined collar, it adds a little bit more than the traditional coastal jacket that typically has just a softer collar. It would be a welcomed addition in colder climates. The jacket does have a nice, racing cut. With long arms and double layer adjustments, you can easily perform all of the necessary tasks on a sport boat without being restricted. The drawcord hem allows you to make the waist as tight as you would like, and the front zipper storm flap has some serious Velcro. I’d put the optional hood and face guard in the good category, but I would have to say that the additional price isn’t exactly “good.” However, it adds a whole other dimension to the jacket. With a hi-visibility hood, it would make any sailor much more prepared to go offshore. With the same adjustments as the like-color hood that comes with the jacket, it has a nice fit with adequate adjustments to ensure the right fit. There are many different reflective patches placed on the brim, top, and back for added peace of mind. The face guard attaches to either side of the hood and makes the coastal-like height of the collar transition to a more offshore-height collar. Rising from the mouth to just below the nose level, the face guard is fleece lined for added comfort. The one drawback being you now have two layers, where water can get in between the two. You will make a few sacrifices to get the “all-in-one” jacket. It doesn’t have all of the nice features of an offshore jacket and leaves out some of the good features on a buoy racing jacket. But, it does a pretty good job. Although it is breathable, it does have a heavy feel. I don’t think it would be my first choice for a rainy summer night here in Annapolis. The wrist has two separate closures, one neoprene and one Isotak fabric. While I like the idea of getting a good seal with the neoprene inner layer, the two straps line up perfectly. So, in addition to it feeling a little bulky, it is also hard to get a reasonable closure with the outer layer. While Zhik’s Isotak jacket has some nice stretch through the shoulders, I wouldn’t say it has nearly as much as the Musto MPX range, which is well-known for having stretch panels. Overall, Zhik presents us with a nice jacket that would be great for someone who wants a little more versatility in their gear. 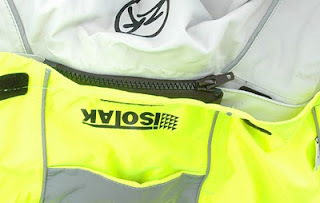 Adding elements of an offshore piece with an athletically cut buoy jacket, the Isotak works well in both sailing environments. 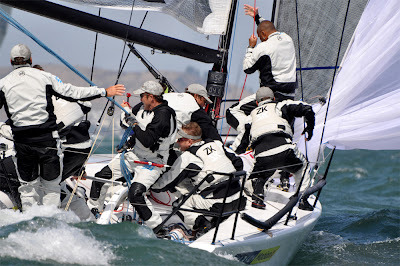 While it’s impossible to make a jacket that’s the best for buoy racing and offshore racing, it does a good job combining the important elements of both. With the same durable fabric as the rest of the line, Zhik’s Isotak smock would be the perfect top for those who wear their gear out quickly or spend most of their days on the water. As far as sizing, all felt they wanted the next size up from what they typically wear in Musto. Also, for those with long arms, we have to let you know, the arms aren’t quite as long as Musto in the larger sizes. But for the smaller sizes (and smaller frames,) the arm length was nice. 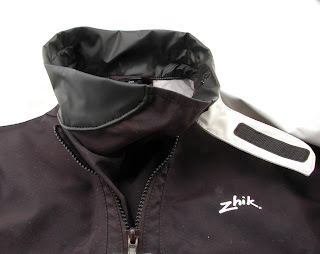 For sport boat sailors or those athletic types, Zhik’s smock certainly has a racing cut. The neoprene waist is longer in the back than in the front, making a nice tight fit that doesn’t seem to ride up like some of the other smocks out there. As seen to the right, it has an inverse drop hem shape. The neck Velcro closure is also conveniently placed with the softer part on the neck. For all the ladies out there that know how painful it is to have the tough Velcro on the neck, this is a welcomed improvement. (Although most companies have picked up on this problem, not all have adopted a solution. Thanks, Zhik!) Also, the wrist seals are nice. They form a nice seal and are quite comfortable. With a pretty sizable tab, it would stay in place even in high-activity sailing. Like the jacket, the optional hi-visibility hood can be attached to make it more versatile. With a florescent hood and face shield, you can turn your buoy racing smock into a little more of an offshore piece. It would be a nice addition for the nights that get colder, with long hours on the rail. It does have some drawbacks – without clear sides, your peripheral vision is limited. While having a tight neck seal on a smock is great, this is just a little too tight. There is a lot of fabric to fold into a small space. The tab that comes across creates a tight-to-your neck feel, with many of the guy’s trying it on complaining about the tightness. It also has some room to let water in if you lean forward. The zipper in the front doesn’t stay up very well – it slips down as you move around. The front pocket is also a bit bulky with a higher than the tab closure (see picture below) that creates three layers of fabric across your chest. The pocket would also be quite difficult to access when wearing a life jacket. Overall, as long as a durable feel doesn’t throw you off, it’s a nice top. It does feel a little heavy, especially in comparison to say the Henri Lloyd Shockwave. If you’re in a hot climate where summer showers are your only problem, this might not be your top choice. However, if you’re sailing where there’s colder water and nastier conditions, this would make a great addition to your gear. It seems to be hard-wearing with good seals. It seems the Zhik Isotak smock would work well on dinghies, sport boats, and wet bigger boats alike. With neoprene stretch shoulders, a serious storm flap and large cuffs at the ankles, the Isotak salopettes are ready to handle what you can throw at them. They have waist adjusters to bring in that extra room if you don’t need layers and have a large side pocket for the extras. With hard wearing Cordura on the seat and knees, these are made to stand up to harsh decks and long hours on the water. Durability is the name of the game with large Cordura reinforcements on the seat and from the knees to the ankles. These salopettes aren’t going to wear out quickly. 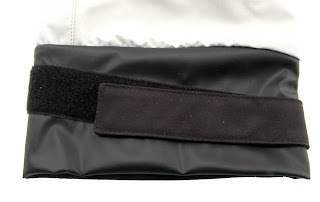 The front zip has full Velcro running down the storm flap that stays in place. I think my favorite part would be the ankle closures. With a large cuff and a long tab, finding the perfect spot for every situation wouldn’t be hard. 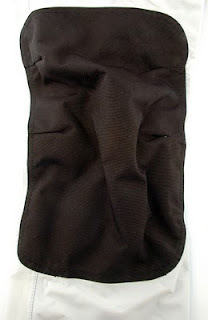 This will allow you to create a tight seal regardless of your footwear choice. Side adjustments make it easier to get rid of extra bulk through the sides. The side pocket is easy to access even in a sitting position and is big enough to serve you well. I wasn’t overly impressed with the fit on the bottom half, and like other pieces in this line, many needed to go up a size. It seems that the top and bottom don’t match up proportionally. After having a few people try them on without going to a larger size – we determined the top wasn’t long enough. Although the Cordura reinforcements make the gear last longer, it does create some bulk and would take some getting used to. The seat and knees are both much larger than other pants. This could be seen as a good or bad thing, depending on how hard you’re wearing them and how you like your pants to fit. The pocket, although easy to access seemed to be not thought through. The possibility that you would open your large pocket and things would drop out seems prevalent. Without a separate section in the pocket, I’m not sure I would want anything in there. Overall, they would work well for those who are athletic and sailing in an athletic scene (think sport boats or bowmen running around the deck). With hard wearing Cordura patches, they would stand up to harsh punishment sliding around on non-skid. The fit seems to run small, but with good ankle closures, ordering a larger size wouldn’t be a problem. Isotak by Zhik is a nice line of gear, and with the versatility of being able to wear it around the buoys or offshore, this gear is great for someone looking to do both. Although there are some sacrifices made when making versatile gear – if you’re actually doing a lot of both kinds of sailing, this is great gear for you. Keep in mind that the fit runs small, and just about everyone went a size up from their normal foul weather gear size. Editors Note: Available now is the Zhik Isotak II kit. Improved from the original range and built on the same technology.